Congrats on a great race! Looking forward to meeting you Shamrock weekend. Hope the weather is good there for the full, but I know the wind is often a factor for the second half of that race. Hi David! Really looking forward to that as well this March! Let me know when your post-race plans come together, I’m traveling solo for that race, so I’ll be very flexible/available for a post-race meet-up! Sure thing. My hotel is right at the finish line, so I’ll probably do a quick change after my half and then enjoy some Yuengling for a while. Feel free to shoot me an email and we can chat about it more. David – that sounds like a plan! I’m also staying right by the finish area (Courtyard) – so we should be able to hook up pretty easily. Best to you with your training! Congrats. As, as usual, enjoy the recaps. I can always pick out a little something I can use for my runs. Thanks Huey! I think sticking to the plan was the key on Sunday. I’m going to try to “live that” each of the next two races and let the chips fall where they may. Wow. I am floored. First time I’ve checked in by comments since NYC. Look out sub-3 hours in Boston. Until then, you should sit back and be very proud of this race. Hey Noah! Great to hear from you. Very encouraging to say the least, it looks like the extra weekly miles, adding doubles on Tuesdays, working the hill repeats both up and down as well as all those additional 20+ milers is putting us in position for a great shot at sub 3:00 in Boston. If we get the weather, I really like our chances. Thanks for the shoutout – always great to hear from you! If that is a near perfect race it must be akin to facing 27 men in a baseball game and getting 27 outs but having someone get on-base (perhaps a passed ball on strike 3 prior to a double play) … looks perfect here Joe – great effort and well deserved results. BOOM went the dynamite! Big time congrats! Hey Jim, thanks so much! I’ve been replaying the race, trying to find a spot where maybe we could have done something a little differently. Of course “run faster” comes to mind, but you and I both know that staying within your capabilities is the way to your fastest time(s) on the clock. Really happy with this one – if we can run the same type of disciplined, technical race in Boston the only thing I’ll need to worry about after we hit the Citgo Sign at Fenway is what kind of picture I want taken at the finish line with the clock ticking under 3:00 hours …. Take good care Jim, glad you guys made it back home safe and sound, we’re thinking about you here in TX. Hey thanks Erin! I agree with you 100%, the weather was such a huge reward after last year’s battle to the finish. Ugh, was that a miserable day. Feeling pretty darn excited about this one on our “challenging” home course. If I can run like that in April – lookout! I love race reports like this: strategy, execution, evaluation, conclusion, lessons. Very impressive, man. I’m very keen to see how Boston unfolds for you, particularly given your positive relationship with tough hills near the end of races. You’ll definitely need that – in spades – for Heartbreak! Hi Matthew! Thanks so much for the visit and the message. I think that racing during a training cycle for an “A” race like Boston is really useful. It can help build confidence, and of course allows you to “train” at a much higher intensity than a typical Sunday long-run, but I think the most valuable aspect is the perfecting of race strategy. Learning how to stick to your plan and hopefully, seeing the results that it can produce. Sunday was one of those days for me – especially running a disciplined race on a very hilly course. The last few hills make heartbreak look pretty tame, but of course the downhill start to Boston and the time when the Newton Hills arrive in the race, make that stretch pretty darn tough. Thanks for everything – on a related note – Restwise told me I was 100% recovered and ready to train hard before the race. 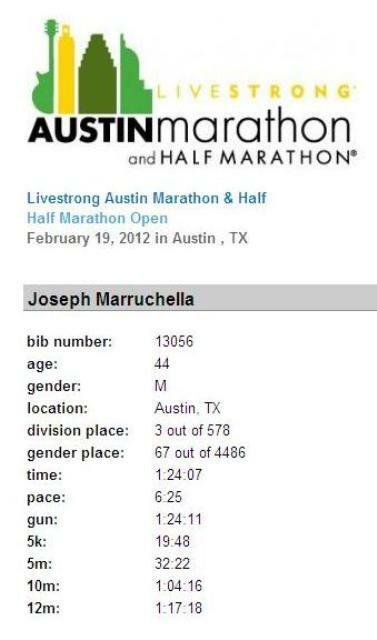 Perhaps I should have expected a near PR on Sunday!